We’ve been very busy painting our new house, and by the time we’re done for the day we’re a bit punchy and wiped out. So, upon seeing the painting sticks, G2 and G3 instantly thought pirate sword fight. After going up and down the stairs (like in The Princess Bride), I got them to pose in front of the not-yet-painted yellow wall, because I could get the good shadows in the pictures. They had a blast, and I happy to hear happy voices, as they had been complaining a wee bit about the lack of chocolate at the new house. I used the sword play and pirate talk as inspiration for today’s lunches. G1’s lunch gets the first place position on this first day back from school vacation. Her Thermos is packed with tomato soup, and the rest of her lunch is packed in her favorite Totoro Bento Box. I’ve included a Lunchbox Love note in her lunch and in her sisters’ lunches. We love the joke Lunchbox Love notes most of all – the girls enjoy sharing the jokes with their friends. At the top right are three pirate faces in tofu, and one pirate sword food pick. I used a different nori face punch for each face, and hand-cut the eye patches out of nori with scissors. At the bottom right of the picture is the top section of the bento. The Laptop Lunch Bento Buddies containers fit perfectly in this section, and keep the fruit from mixing with the desserts. Today G1 has strawberries with pirate swords. In the rest of that section are a homemade flower lollipop with mini MnMs as petals, a gold pirate treasure coin, and two Enjoy Life chocolate brownie cookies. G3’s lunch is packed in an Easy Lunchbox. She has three ham roll-ups speared with pirate swords in the main section, and a tofu pirate with nori face details in a silicone cup. In the top right section she has a gold pirate treasure coin, and in the bottom right she has grapes that have been speared on pirate swords. G3 is the tortoise in her school’s Aesop play, so she has longer rehearsals for the next couple weeks, which means she needs a slightly larger lunch than usual so she can have a snack for play practice. She has a Snoopy Bento Box with a chocolate flower lollipop and a silicone cup with two Enjoy Life Snickerdoodle cookies. This week we are painting the new house, so I don’t have as much baking time as usual, which means pre-packaged cookies. Enjoy Life makes wonderfully soft and yummy allergy-free cookies that fit beautifully in lunchboxes. G3’s snack is a Bento Buddies container filled with gf cheese crackers. G2 also has a lunch packed in an Easy Lunchbox, but hers has dinosaurs and flowers. In the big section of her bento are some dinosaur broccoli and potato bites from Whole Foods (G2 is a vegetarian, so she had these while her sisters had dinosaur chicken nuggets last night). For a little protein punch I used two vegetable cutters to cut flowers out of tofu, and then decorated them with different food picks. At the top left she has strawberries with some flower food picks and a silver chocolate coin. At the bottom left are two Enjoy Life chocolate brownie cookies. Laying across the top of her bento is a chocolate flower lollipop. Those were so fun and easy to make! I’m so glad I have a collection of chocolate molds I got from a friend when G3 was a baby – they really turn a little chocolate into a special treat. 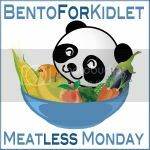 This post is linked to Meatless Monday on Bentos for Kidlet. Anna from Becoming a Bentoholic posted a great bento with the word LOVE spelled in fruits and veggies during the Valentine’s Blog Hop, and she inspired today’s LOVE lunches. I wish I had the cool bento box she has, but I made do with what I had. The two lunches are very, very similar, as you will see. Yesterday I was excited to be part of a blog hop. Please check out yesterday’s post, and then continue the hop. There are links to both hops and a linky party over at Bento Bloggers and Friends. Today G2’s lunch spells out LOVE in silicone heart cups inside her Easy Lunchbox. First the L is baby carrots with a little Snoopy container filled with ranch dressing. the O is written with food safe marker on sliced mozzarella atop Havarti with dill. The V is a heart-shaped MOMables-inspired gf crackers, with a food safe marker to make a red heart inside a heart. The E is written on another sliced mozzarella heart. At the top right are some strawberries cut into the shape of hearts. In the bottom right section is a decorated cupcake with the word LOVE spelled out with alphabet food picks. G1’s lunch also spells out LOVE, but hers isn’t done in cheese and carrots. I used tofu and cookie cutters (and a knife for the L & E) to spell LOVE in the bottom half of her Totoro Bento Box. The top section has heart-shaped strawberries and a chocolate cupcake with a Valentine’s Day face on it. In addition, she also has a Thermos filled with tomato soup. Today I’m really excited to be a part of a blog hop! 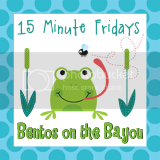 The Bento Bloggers and Friends group is hosting two Valentine’s Day Blog Hops today, and after looking at my bentos please be sure to hop over to Perry’s Dreams, Schemes, and Bento Themes blog and continue hopping! If you’re new to my blog, welcome! I have 3 daughters, and today I’m featuring the lunches for the older two. The youngest’s lunch is just chicken soup, grapes, and a cupcake, so nothing fun today! All three girls also have Lunchbox Love Valentine’s Day notes in their lunches. G2’s lunch is a return to the Pokémon lunches. In her Easy Lunchbox I’ve packed a silicone heart cup filled with penguin-shaped MOMables-inspired gf crackers, and I used a food safe marker to add some details. She has another heart cup with Havarti with dill cheese and a cute 3D heart to jazz it up. I used food dye to color the sushi rice and paint cheese to make two Luvdisc Pokémon. I used a nori face punch for the eyes and a circle punch to make the cheeks and lips out of sliced mozzarella cheese. I hope she likes them! In the top right section of her ELB are four strawberries cut into heart shapes. At the bottom right is a gluten-free chocolate cupcake that G2 and G3 over sprinkled. I added a little chocolate heart in red foil as a treat – G2 is spending the day “shadowing” a student at a private school she’s hoping to attend, so getting a little chocolate is rather like getting an energy and love boost. G1’s lunch is simpler – she wouldn’t appreciate a Pokémon lunch. In her Thermos is tomato soup to keep her warm on a cold day. The rest of her lunch is packed in a Totoro Bento Box. At left, in the top section, are strawberries cut into heart shapes and decorated with a 3D heart. Her cupcake is decorated with some face candies I found at Target rather than a bazillion sprinkles. In the bottom section of her bento she has three tofu hearts that say I Love U, plus a pink sushi rice heart with a nori face on top. Click the blog hop image to hop on over to Perry’s blog to see what she’s done for Valentine’s Day, then keep hopping to see all the blogs on today’s blog hops! If you’ve come back to my blog after making the rounds of the 2nd Blog Hop, start here to check out the first blog hop! Last night we went to see The Lego Movie. We all highly recommend it! It was really great! And, while we’ve hit the jackpot with the past 2 movies we’ve seen (Frozen was the other one), it is rare to have all 4 of us (42, 15, 13, 10) love the same movie. And the soundtrack. Everything is awesome! Anyhow, we had frozen pizza doctored with extra cheese and toppings for dinner before the movie, and that means leftovers for lunch! G1 and G3 have the same lunch as G2, just in different containers, so I’m just posting the one lunch. In her Easy Lunchbox, G2 has a chocolate cupcake with a bazillion sprinkles at the top left, plus a 3D heart. At the bottom left she has some green grapes and a red grape sliced diagonally and put back together in a heart shape with a heart mini fork. There’s another 3D heart in with the grapes, too. In the large section of the ELB G2 has two slices of olive pizza with Snoopy in a heart written on cheese with food safe marker on top. In a mini silicone cup is a red foil chocolate heart. She also has a Lunchbox Love Valentine’s day note to make her feel special. 4 days ’til Valentine’s Day! G1 and G2 have Valentine’s day lunchboxes again. I found some cute and inexpensive scrapbook paper at Target for Valentine’s Day backgrounds, too. We had decorated cupcakes this weekend, also with decorations found at Target. I made faces, the younger girls just poured on lots of sprinkles! We had a fun time. Somewhere on Instagram I saw someone make a sandwich into a Valentine’s Day letter, so I borrowed the idea using mozzarella cheese. In addition to the cheese and food safe marker decorations G2 has her usual lunch in her Easy Lunchbox. In one silicone heart cup she has Havarti with dill cheese and a heart mini fork. In her other cup she has penguin MOMables-inspired gf crackers, also with food safe marker detailing. In the top right section she has some carrots and a Snoopy cup of ranch dressing. At the bottom right is her chocolate cupcake with a bazillion sprinkles. I need to stop at the grocery store this afternoon to get more fruit, so she and her sisters have carrots in place of their usual fruit in lunches. G1 has a Thermos filled with tomato soup and her usual Totoro Bento Box filled with other treats. In the bottom, sealed section she has 6 tofu hearts. Three have faces using a nori face punch, and three have messages like Conversation Hearts written with a pink food safe marker. In the top section is a mustachioed cupcake, a rainbow star container of ranch dressing, and a silicone cup filled with carrots. This post is linked on Bento Blog Network – Hearts and I Heart Lunch. Counting down to Valentine’s Day! Today’s lunches are pretty simple, just the Sweetheart conversation hearts done in cheese and in tofu. G2’s lunch is packed in an Easy Lunchbox, which is the bento that works best for her. She has a silicone cup with fishie MOMables-inspired gf crackers. I added the eye and smile with food safe marker. In another silicone cup is some Havarti with dill, plus a heart mini fork. I used a heart cookie cutter, food safe marker, and sliced mozzarella cheese to make conversation hearts as an edible decoration. I ran out of chocolate cookies (and we’ve eaten all the wedding cake), so in the top right small section is a mini silicone cup with chocolate chips plus a 3D heart. In the bottom right section are some green grapes, one of which has been sliced diagonally and put back together to form a heart with a heart mini fork to keep it together. I’ve also included a Lunchbox Love Valentine’s day note to make the lunch special. G1’s lunch starts with a Thermos of tomato soup, as usual. In the top section of her Totoro Bento Box is a silicone cup with two lemon wafer cookies. Another cup is filled with green grapes plus a 3D heart to make it Valentines-y. She also has a Lunchbox Love Valentine’s day note to round out the top section. The bottom section is simply tofu cut into heart shapes with conversation heart messages written with food safe marker. Simple and cute. Yesterday we had a snow day. I, for one, was intensely grateful for it. I so needed that quiet, relaxing time. I’ve had a headache since the week before Thanksgiving, and I’m taking a new medicine that makes me tired. Having a full day to nap and read and relax was wonderful. It left me refreshed and excited to make lunches that were a little more fun than I had been making. G2’s lunch is a valentine in an Easy Lunchbox. I made pink sushi rice, then formed it into hearts and used a nori face punch to put faces on the valentine hearts. I used food safe marker on sliced cheese to make the valentine and to add details to the penguin-shaped MOMables-inspired gf crackers in a silicone heart cup with a 3D heart. She also has Havarti with dill in a second silicone heart cup. In the top right section are two chocolate wafer cookies, and below that are some green grapes. By cutting the grapes diagonally I was able to put them together as hearts using a heart mini fork. G2’s lunch is also perked up with a Lunchbox Love Valentine’s day note. G1 has a very similar lunch, with a few minor changes. In the top of her Totoro Bento Box she has a silicone heart cup with two chocolate wafer cookies and a 3D heart. I added some green grapes to a silicone cup, and made two into hearts with two heart mini forks. She also has a Lunchbox Love Valentine in the top section. She has some Trader Joe’s tomato soup in her Thermos, too. In the bottom section of her bento are some more hearts. She has a pink rice heart with a face, three tofu hearts with faces, and two Sweethearts candy-style hearts with HUG and LUV U written on them. This post is linked on What’s for Lunch Wednesday and I heart lunch and Fun Food Friday. This post is linked on Bento Blog Network – Hearts. Today’s lunches are partly just vehicles for delivering wedding cake into the girls’ tummies (I got married on Sunday – Surprise!). My mom made a devil’s food cake with white chocolate icing, and it’s divine. However, it’s also 4 layers, so it fills up the lunch boxes very well. G1 has tomato soup in her Thermos. The top of her Totoro Bento Box has a slice of wedding cake with a 3D heart and a silicone cup with homemade fruit leather and a heart mini fork. In the bottom section of her bento are some hearts cut out of tofu and decorated with pink and purple food safe marker. G2 also has wedding cake with a 3D heart at the center of her lunch, packed in her Easy Lunchbox’s biggest section. In the top right small section she has fruit leather on a heart mini fork. In the bottom right section are slices of blood orange, which always looks so pretty. In her Snoopy bento box at the top are MOMables-inspired gf crackers shaped like fishies and some Havarti with dill, each in a silicone cup. Yesterday, after pre-making today’s lunches, I got married. We had planned to get married with a big reception in April, but it all worked out better to have a quick, easy, and small surprise wedding on 2/2, and then we’ll have a big party this summer and exchange rings there. My oldest daughter and my mom made a cake and did the flowers at right. If you want to read more, I posted all about it on The Year of Living Change-erously. As I was making lunches I was trying to come up with something quick and easy that also felt loving. My mom and stepdad were taking my daughters to school today, so I couldn’t have anything that required too much work in the morning, nor something that was overly involved, as I only had so much time between church and the wedding (that’s the only time I had to get anything done). G2 has a penguin love lunch. Her Easy Lunchbox has a silicone cup filled with Havarti cheese and a 3D heart, then another with penguin-shaped MOMables-inspired gf crackers. I also added a couple pieces of cheddar and provolone cheese in heart shapes to the large section. At the top right section is a small piece of Toblerone, two chocolate wafer cookies, and some homemade fruit leather rolled up with a heart mini fork. In the bottom right section is a clementine. She also has a penguin Squooshi that holds homemade strawberry applesauce. G1’s lunch includes a Thermos filled with Trader Joe’s tomato soup and a Totoro Bento Box filled with other goodies. She has homemade fruit leathers rolled up with a heart mini fork in a silicone cup. In another silicone cup are two chocolate wafer cookies. Also in the top section of the bento is a clementine with a 3D heart and a tiny Toblerone piece. In the bottom section are some hearts cut out of tofu with a red heart to add a bit of pizazz. A simple but filling lunch. Finally, G3 has a Thermos filled with chicken and rice soup. She also has a walrus Squooshi, but hers is filled with regular applesauce. In a small container from Target are some fruit leathers rolled up and stuck with a heart and a silicone heart cup with two chocolate wafer cookies and a 3D heart, plus a little piece of Toblerone.